We all love Fruit Ninja. Cheerful, flashy fun based on a strikingly simple idea, Halfbrick Studios’ slasher made perfect use of the touch interface. 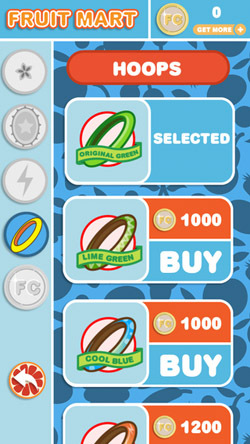 A quick look at Fruit Hoops shows signs of Fruit Ninja flavor, but don’t let their titles mislead you – Fruit Hoops may have the fruit, but is nowhere near as juicy as you might imagine. 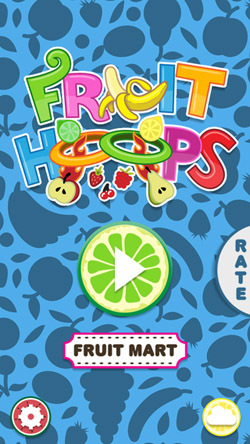 As the name so succinctly points out, this one is all about getting fruit through a hoop. 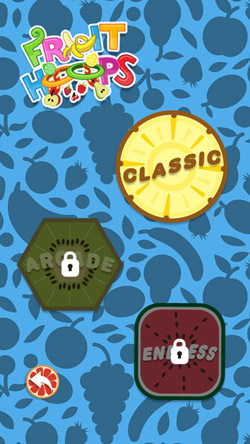 A couple of fruity variants drop down the screen, and you’re tasked with moving your little hoop on a single horizontal plane to catch them before they slip past. Once in a while you’ll come across a pack of dynamite (which you’ll want to avoid, obviously), or a fancy papaya-type fruit which acts as a score multiplier. Let three fruit get past you uncaught, and your fruit hooping days are over. It’s a simple concept, which doesn’t have to be a bad thing – some of the most addictive games of all time are terribly simple. The problem is that, even with its simplicity, Fruit Hoops never gets exciting. 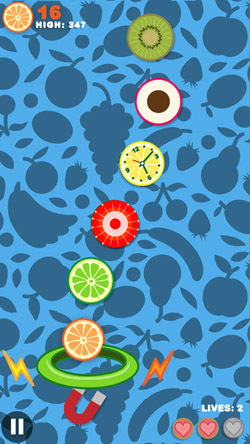 Instead, the fruit drops at a pedestrian rate, in straight lines, with a severe lack of urgency. Even the bulging dynamite packages won’t get your pulse racing, because all they do is knock a few points off of your score. And since you can play for what feels like an eternity, you’ll quickly earn those points back. Even if things get a little busy, with one or two errant fruit looking to put an end to your winning streak, all you need to do it knock them off the sides of the screen and you won’t be penalised at all. This could well be a programming oversight, because it makes the game so easy that it borders on pointless. The quaint visuals are a redeeming feature, developer Mubeen Sarwar’s charming illustration style adding some much needed flair to the otherwise bland Fruit Hoops experience. The 2D presentation doesn’t have the colourful bounciness of Fruit Ninja’s polygon-based visuals, but it works in this instance. Undemanding gamers might not worry too much that there is no real challenge here, but the bovine nature of Fruit Hoops’ game design will have most gamers bored to tears within minutes. The excessive grind required to unlock different colored hoops or bonus fruit just doesn’t feel like it could possibly be worth the time it would take, so most wouldn’t bother to play long enough to find out. The only viable target market for Fruit Hoops would be children with low expectations, but kids have notoriously short attention spans, so perhaps not. To be blunt, this is a cute, simple game which lacks a compelling reason to keep playing.